Thanks. That's true; they are just getting in the laser machines in a week or two after going to a veterinary conference, not sure that the other veterinary office that sees exotics has them. I am very fortunate that even though I live in a little county that really doesn't have much going for it (terrible economy, plenty of mills, surplus of irresponsible pet owners for such a small county), we have good exotics veterinarians who are not only good but compassionate, and to both animals and humans that really care well for them. I might have to start up a thread in Cavy Chat to sell small animal related items. I didn't want to do it, as not to compete with the wonderful bed and cage blanket makers and artists here that are well established, it feels rude to me. 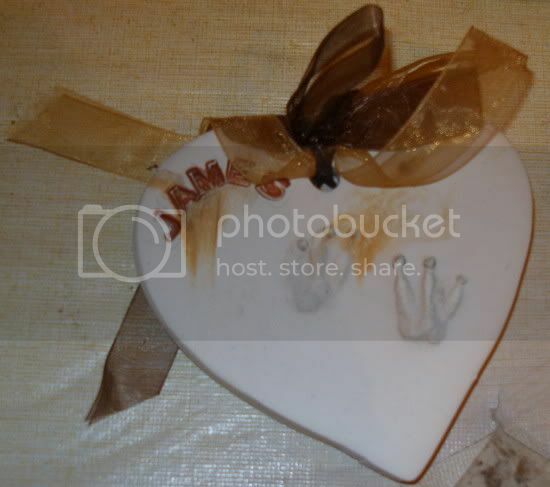 But I think it might be best, it would certainly take a lot of my anxiety away if I can get some items selling. 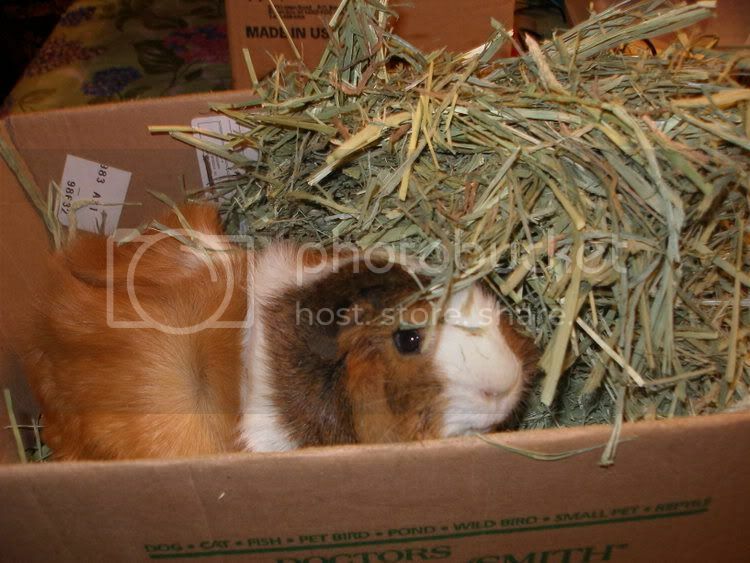 Lux loves burrowing and playing in hay, so I let her be in the smaller hay box for a little while (very closely supervised of course). She's actually excited, not scared in the second picture, because I tore up some lettuce and she heard it. Eating organic green leaf lettuce while in the hay box, how spoiled do you get? Lux is adorable. She looks very alert in the 1st pic - did she hear the fridge door opening? 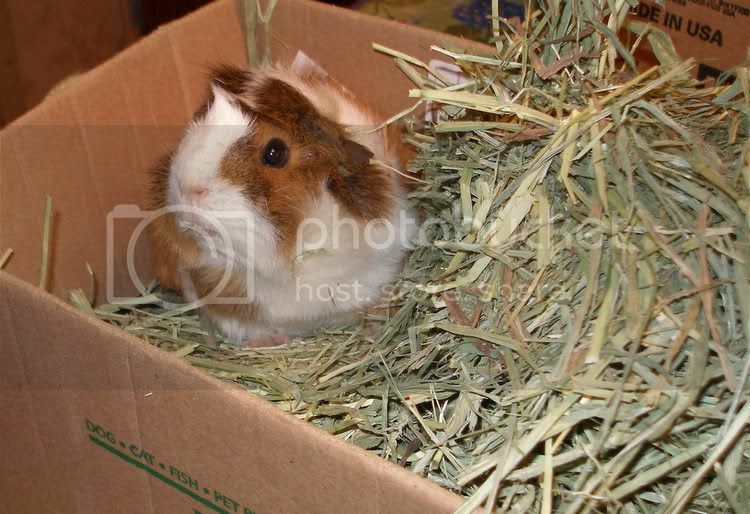 She heard the other cavies wheeking in protest that I put her (as opposed to them) in the hay box, heh. OMG, what a cute pig! For those that don't know, she's the baby I adopted from Lisa at Foggy Creek Cavy Rescue (http://www.petfinder.com/shelters/WA254.html). More pictures to come soon. I have an idea for some thanksgiving pictures with fake vegetables/fruits (nothing they could bite pieces off of, of course). A couple of days ago we had to say goodbye to a special little special needs boy. He was originally given six months to live but went downhill overnight despite medications and his body was clearly giving out. I feel like we didn't have enough time together. He had just enough time to learn not all humans were bad or all that scary, then he left us. Goodnight my little James. I hope you enjoy the ladies we've rescued; Mocha, Lilac, and Sleighbelle over the bridge. I never regret taking you in and showing you love, but I regret that we didn't have more time together and that nothing I did or spent could save you, even though I caught the problems early-on. 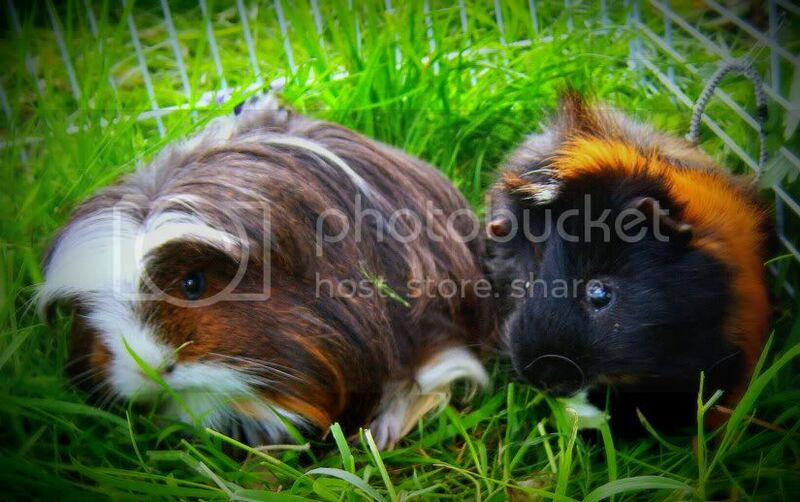 Alistair (left) and James (right) on their first spring outing. To graze, supervised, under a pet store lid in a shaded area. So sorry about James but he knew your love. Very sweet pic of him enjoying fresh grass and the out doors. As soon as the weather is nice enough (I was too depressed when it was, so I just clipped them fresh grass instead or bringing them out, and it only lasted two days), I'll be taking the critters out for grazing under the pet store lid. This will be Lux's first time out here. I can't say first time out in general, because the person who took her to Lisa's rescue found her abandoned out in the woods by herself. I was just thinking looking back at your pics that we haven't seen Lux in a while. I'm sure she'll love being out and munching on fresh grass. It's tough when you lose a loved fur kid. Hang in there. I know, I've been terrible about uploading the pictures I've been taking. And for awhile I was having camera-issues so I wasn't taking as many as I usually do. I haven't posted any Cinnabun ones recently either, bad me! So sorry about your loss. Hugs! 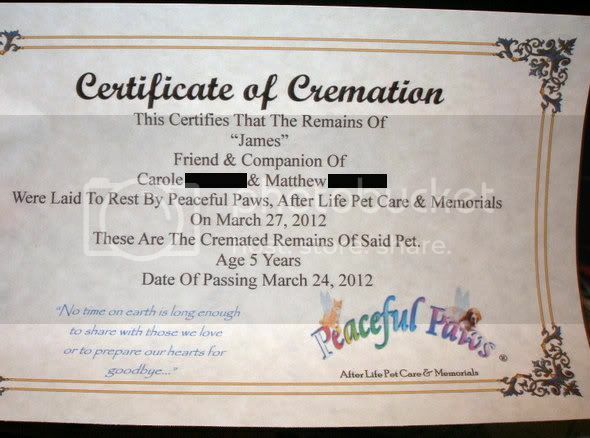 I got his ashes back, and I found out they are going through a new company called Peaceful Paws. I was really surprised by the extras, and how nice (and small) everything was. I was expecting the standard larger, non-personalized (but still nice) box that the local humane society does. For some reason every shot I took of the ashes holder was blurry. Ornament with his paw prints. I'm so glad they added this freebie in. The bracelet color in the picture was ruined by the flash; it's a really pretty pastel, and the yellow is not obnoxious in real life. 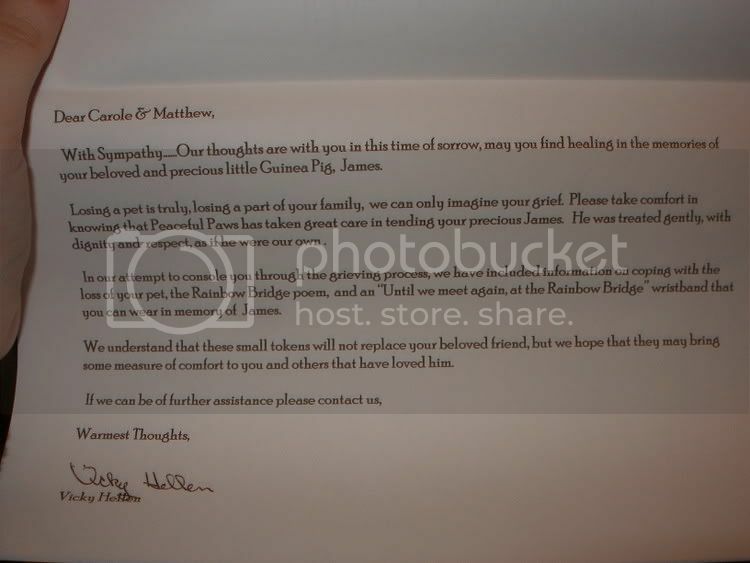 The whole thing reads "Until we meet again at the Rainbow Bridge". I wish I had something like that for some of my passed pigs. Those are indeed very nice touches and very meaningful to the pet owner. I especially like the paw prints. I'm sorry you lost James, CM. He was a cute little guy. I love that they took his paw prints for you. That's the sort of thing I'd want to have as a keepsake. 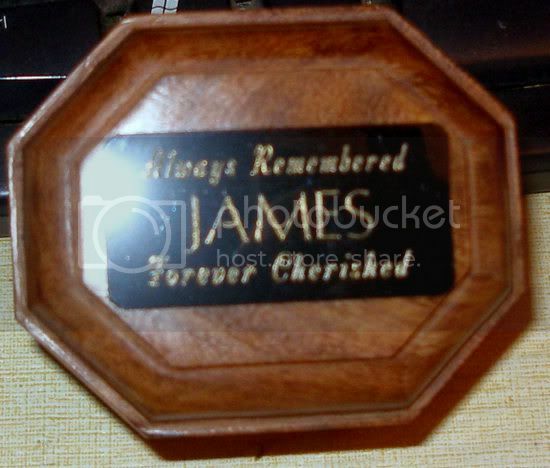 You have a very nice rememberance package for James. All of those things are nice. Thank you Clairey. I wish I would have known about this place sooner. I was so grief-stricken I didn't think to have SleighBelle and Magellan's paw prints done, because my brain wasn't functioning to full capacity and at the time I couldn't bring myself to do it, to see the bodies after they'd passed. But at least I had private cremations done. That's a great rememberance for James. It looks as though they take special care.